If you’ve ever asked about this chicken and rice soup recipe, then I might just start enthusing about how it was such a peerless experience that I had. Tender, fresh chunks of veggies, together with the rich and nutritious chicken broth – these are the things that will make a good companion for a hearty, creamy and super simple staple. This hearty, comforting chicken and rice soup will not only make you want to have your spoon dunked all the way in, but surely make a perfect dip for breads too. What kind of rice is best for the soup? Most commonly white rice, I’d say, like all grain types of white rice. Additionally, wild rice or brown rice can do just the same, just that they’d demand a longer cooking time (at least 40 minutes or so for a small batch of rice, and 20 minutes for white rice). So if you don’t have that much time then go for instant rice, which will take you just 5-10 minutes to cook. Instant rice with spray-painted nutrients (which is a make-up for the lost of redeeming qualities and natural texture), however, surely cannot attain the same quality of nutritious and freshly-cooked rice. So if there’s any advice I could make, then there’s this: Go for whatever rice you like. If you’re worrying about not being able to finish the rice before it turns bad with some unpleasant smell, then cook only a small batch of it. Rice is super versatile for many entrées and not just this soup alone, it’s common for rice to be adapted here and there (in case you accidentally made too much of it). Plus, leftover rice can always be reheated at ease, as long as the reheats are carried out within 3 days’ time. How many calories in chicken and rice soup? 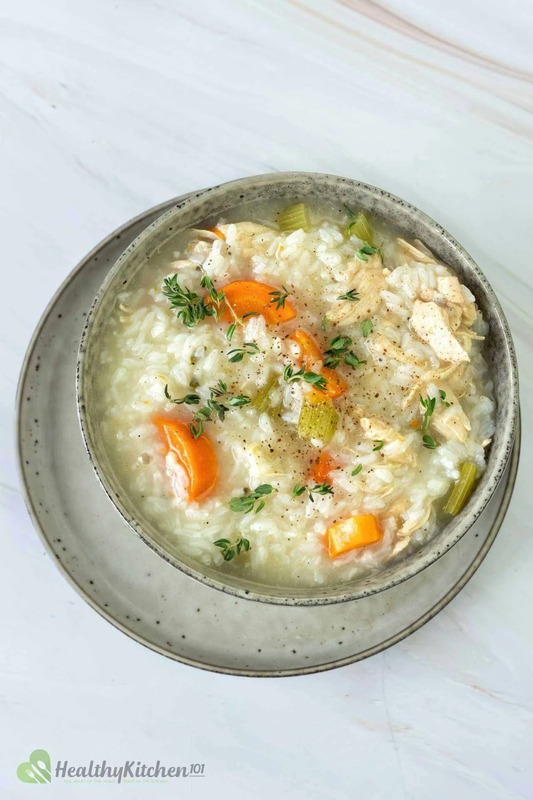 One single cup of chicken and rice soup delivers you 120 calories. This soup is so light and healthy you can find only veggies besides chicken and rice. Sometimes you can go a bit more creative by adding some extra potato chunks or mashed potato flakes to increase the thickness in the soup’s texture. Can you freeze chicken and rice soup? Yes, totally. But there will be more than just a few side notes, considering freezing something liquid with rice and veggies. There are two most common ways of refrigerating a liquid meal: putting it into either a freezer container or a freezer ziploc bag. Both will require you to completely cool the soup down to room temperature before putting to freeze, as a quick temperature shift may cause bad effects on the food safety. Though frozen starch when reheated are still edible and taste just fine like before, it’s still better to leave the starch out. In some cases, it could turn a bit too soft and mushy when put to cook more than once, but there is no huge vex actually. For freezer container: The most important thing is to neither overfill nor underfill it. No filling it up to the top and no filling to just half the freezer container or less. Your soup will expand in capacity when put to freeze, but can also bear freeze burn if getting in touch with too much air while leaving it overnight in the fridge. If you’re only freezing a small batch of them, make sure to use a container with corresponding size to prevent the above problem. For freezer ziploc bag preservation: Simply fill the bag with the liquid and zip it up. It’ll be wonderful if there’s a vacuum sealer nearby in your kitchen space, otherwise, you’ll be needing some airtight sealing foods skills. Anywayyy, this method will leave you some kind of a “soup brick” the next day you take it out, which will probably make the defrost much less trying. To reheat, just let the “brick” defrost a bit first, then toss it into a saucier on low heat. After filling the soup into the bag, zip it up but leave about an inch left unsealed, then put the bag to a loaf pan filled with water. Water pressure will help push all the air out through the small hole made by the unsealed zipper as said. Let the bag sit as low as possible but not completely drowned in water, then remove them and there you have an airtight ziploc bag without any help from a vacuum sealer. Okay so here’s one final dash: please keep in mind that the reheat should also follow the temperature shifting rule as above, which means you should never go straight to high heat in the first place. Instead, turn the stove up on low heat, then increase the heat level bit by bit later on. Chicken and rice soup is also a bright and cool treat for those who are battling ailing colds or sniffles. Just make piles of it, fridge store and then warm it back again each meal. You’ll feel renewed in a matter of minutes. Heat a stock pot over medium heat, pour in the olive oil and all the vegetables in the ingredient list above. Stir them for 5 minutes to soften a bit. Pour the chicken broth to the pot and bring it to a boil. Add in the rice and chicken to the liquid and cook on medium-low heat for half an hour. Season the soup with pepper and salt, stir well then remove from heat and bring to serve while it's still piping hot. You can bring leftover chicken to this soup or cook a whole new batch of chicken, all up to you. But cooking the chicken may take about 10 minutes or so (which hasn't been included in the cooking time mentioned above), so consider this to your time limit, and better not let your table await their meal. Chicken broth is available both regular and low-sodium, so please be noted when taking a tour through grocery stores. Also, my recipes have always been with Kosher salt, which has much less saltiness in comparison to common sea salt. So the bottom line is, no matter what kind of broth you're going for, please keep an eye on the amount of salt when seasoning and be careful not to over-salt your soup.